"My dad said I was an afterparty baby; this goes out to all the accidents out there; keep on making mistakes" - from "Do I Miss My Friends?" 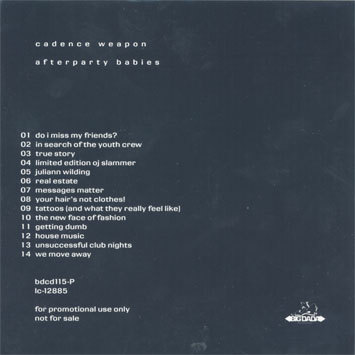 Following on from his critically-acclamed debut "Breaking Kayfabe," Cadence Weapon aka Rollie Pemberton returns with the epic "Afterparty Babies". Dedicated to ‘all the accidents out there,' the record is a testament to Rollie Pemberton's first influence, his father, Teddy Pemberton. A native of Brooklyn, NY, Mr. Pemberton created The Black Sound Experience radio show on the University of Alberta's CSJR station in 1980, and is credited with introducing hip-hop to Rollie's hometown of Edmonton, the capital city of Alberta. Rollie says he "wanted to make music that afterparty babies are created to" and the Afterparty Babies experience takes shape from this premise. But Pemberton's route into this theme is through stories of friends and feelings, crews and club nights, hometowns and heroes, media and fashion. This thoughtfulness, though, is tied to punishing, uptempo electronic music which is a million miles from the safe world of ‘underground hip hop'. Afterparty Babies is an almost indescribable explosion of ideas, feelings and musical vision fuelled by Mr. Weapon's experiences over the last few years as a writer, producer, touring artist and club DJ. 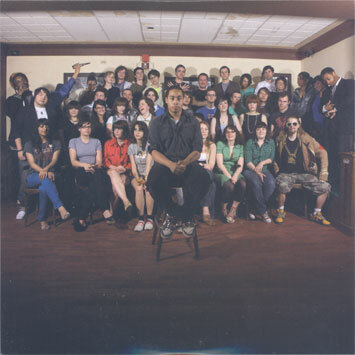 Pemberton has played shows with Spank Rock, Lady Sovereign, Jurassic 5, TTC, New Pornographers, Final Fantasy, and De La Soul. He has rocked guest performances with The Klaxons, Hot Chip and Islands; he remixed Lady Sovereign, Kid Sister, Disco D, Busdriver he's been featured on tracks with Buck 65 and Anti MC. But more than any name-dropping, this 21 year old deserves to be judged on the strength of his music alone. 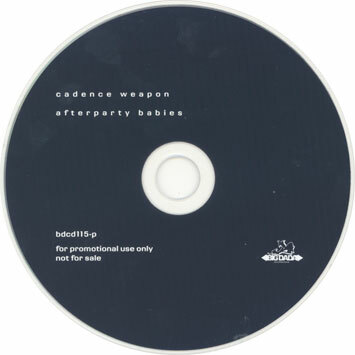 Funny, heartfelt, fiendishly clever, testosterone-pumped, sensitive, a pure aderenalin rush, "Afterparty Babies" is the real thing - a unique, genuinely original hip hop record.